There are places that surprise, shock or simply do not leave most people indifferent. There are such amazing places that transform the soul, leaving a deep trace in it. One would want to return to such corners of our planet again and again, they seem to beckon the astonished man to themselves. And this is an amazing mystery. One of these places is undoubtedly the island of Valaam. The most important reason to visit Valaam is the Transfiguration Monastery, where thousands of pilgrims come every year. The date of its inception is 960. A harmonious ensemble of the central monastic estate is located on a high hill. 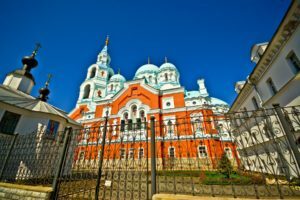 In the center of it is located the Transfiguration Cathedral, where the holy relics of St. Sergius and St. Herman of Valaam are kept. There are several sketes and farmsteads on the territory of the monastery. Having visited them, you will feel the special atmosphere of the monastery and its inhabitants, penetrate the spiritual culture of these places. A great emotional and spiritual pleasure will be delivered to you by the choir of choristers of the Valaam Monastery. Their amazing voices are filled with sincerity. the incredibly beautiful nature of Karelia is complementing the amazing atmosphere of the island, with its fluffy coniferous forests, steep cliffs and clean air. In just one day you will have time to enjoy the peaceful beauty of the island, to visit fascinating excursions, to distract from everyday vanity and devote time to thinking about something more important. Your feelings and thoughts will gain unprecedented harmony with the world around you. Tourists must stricktly obey the dress-code on the island. Ladies must wear skirts of the normal length (at the knee level or below) and a shawl on a head. It is prohibited to the ladies to wear trousers, shorts, short and transparent skirts, decollete. Men can not go to this excursion in T-shirts, shorts, hats or caps. Sportsuits are also not welcome. The overview of the tour: first, you will have a private transfer on a comfortable AC vehicle from the hotel to the town of Priozersk, that is located on the shore of the lake Ladoga. Your personal guide-translator will accompany you from the very start of the tour. The driving time to Priozersk is nearly 3 hours. At Priozersk you will change to the hydrofoil boat, which will take you to the island of Valaam. The time of 1-way transfer from Priozersk to Valaam is nearly 1hr 15min. At Valaam, you will be met by the local guide, who will provide the excursion. Your personal guidee-translator will also be at your service. The total time that you will spend on the island is about 7 hours. After the island tour you will have again a hydrofoil ride from Valaam to Priozersk (1h 15min) and a personal transfer from Priozersk to your hotel (nearly 3 hrs). 11.00 am – 12.30 pm A trip from Priozersk to the island of Valaam (about 1 hour) on a high-speed hydrofoil boat “Meteor”. Mooring of the ship in the Monastery Bay. 12.30 pm – 14.30 pm Tourists are welcomed by the guides of the Pilgrimage Service. Walking tour to the Central Manor of Stavropigial Savior-Transfiguration Monastery. Visit to the main cathedral, where the holy relics of St. Sergius and St. Herman of Valaam are located, and the Valaam icon of the Mother of God. 16.30 pm – 18.00 pm Walking tour “Nikolsky Skete”, one of the most beautiful monasteries of the Valaam Monastery. 18.00 pm – 19.30 pm Departure from Monastery Bay to Priozersk on a hydrofoil boat. 19.30 pm – 22.30 pm Private guided transfer from Priozersk to Saint-Petersburg. Transfer to the hotel. End of the tour.